Grease and line a 9-inch springform pan with parchment paper, or you can also make this in a 9-by-9-inch baking dish. Add the eggs, vanilla and freshly grated ginger, and mix until they are also well incorporated. Sift together the flour, baking powder, salt and cardamom. Slowly add the dry ingredients to the wet ingredients, and mix until just incorporated. Be careful not to over-mix. Pour the batter into the lined and greased cake pan. Add the sliced plums on top of the cake; they will sink as they bake. Top the cake with a generous sprinkling of Turbinado/raw sugar, or regular sugar if you don’t have raw sugar. Serve topped with whipped cream or ice cream. Can be made a day in advance. Serves 8-10. 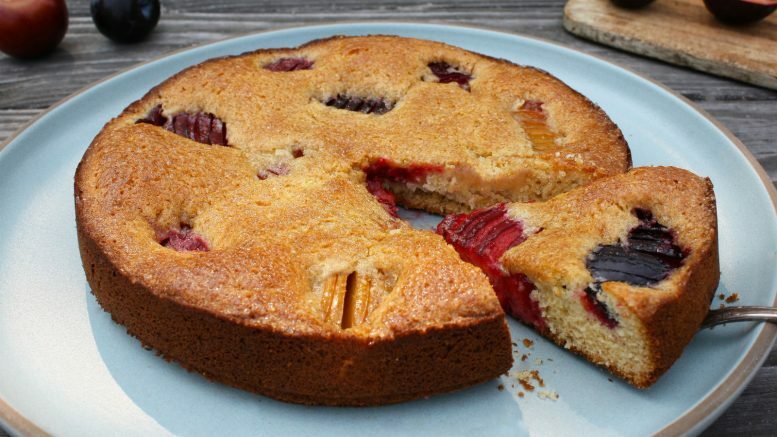 Be the first to comment on "Sunken Plum Cake Recipe"